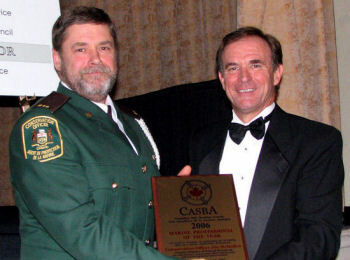 The Ontario Ministry of Natural Resources and the Ontario Conservation Officers association congratulate Jim McMullen, Upper Great Lakes Enforcement Unit as the 2009 Ontario Conservation Officer of the Year award recipient. Jim McMullen was appointed as an Ontario Conservation Officer in August 1981. Throughout his 28 years of service as a Conservation Officer, Jim has demonstrated professionalism in every facet of his life. He is an officer whose character is beyond reproach. Jim wears his uniform with great pride, whether he is doing management duties, enforcement field duties, delivering presentations to schools, youth and special interest clubs, community events, volunteering with outside agencies, working with other agencies, carrying out his duties as a member and past president of the Ontario Conservation Officer’s Association, he has always performed those duties honestly and sincerely with nothing but the conservation and protection of Ontario’s natural resources in mind. Jim has always been eager to go above and beyond the normal duties associated with being a Conservation Officer. For over 14 years, Jim has been a Marine instructor training Conservation Officers, Deputy Conservation Officers, Park Wardens, Ontario Provincial Police and York Regional Police. Jim was recognized for his efforts to have Conservation Officers appointed and trained to enforce the Small Vessel Regulations by the Canadian Safe Boating Council (CSBC) in 2007 as the recipient of their Marine Professional of the Year Award. The award recognizes an outstanding act of boating safety by a marine organization professional as an individual committed to boating safety in Ontario. To quote Jim, “CO’s check thousands of boats each summer, and if we can save just one life by ensuring that someone had a life jacket with them it will be time well spent”. 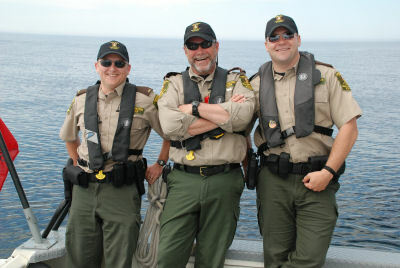 No police service in Ontario spends as much time on the waterways as do Ontario’s Conservation Officers. It just makes good sense to give CO’s the tools to do this public safety enforcement while they are already out there”. The CSBC stated during the award presentation that “this single event increased marine law enforcement presence by about 40%…probably the largest single increase of marine safety enforcement ever in Canada”. 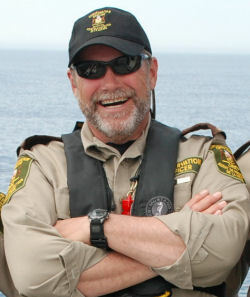 Jim in fact did save a life on May 5, 2009, subsequent to the Officer of the Year Award, while participating in a night navigation exercise of the OPP Launch Vessel training on Georgian Bay. Officers Mark McMillan, Jim McMullen, and Sean Cronsberry (shown in the photo), spotted and rescued a capsized kayaker who was suffering from advanced hypothermia, at night, and over 1 km from shore. During Jim’s normal daily duties as an enforcement officer, he is a leader to his peers and is always available to provide knowledge, expertise and advice as a result of his vast area of experience. He has mentored new hire officers as well as experienced officers, deputy officers and enforcement interns. He has earned the respect of all those who know and work with him. The official awards ceremony took place at the annual OCOA Conference held in Peterborough on August 14th and 15th. The Officer of the Year Award acknowledges officers like Jim, that have demonstrated the highest level of dedication and professionalism amongst our ranks and pays tribute to the high quality of Conservation Officers in the Enforcement Branch. 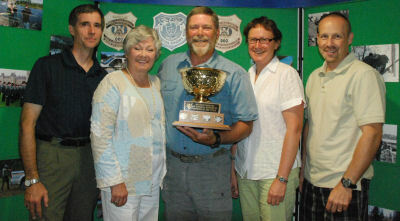 Congratulations to Jim as the 2009 Conservation Officer of the Year!